We would like to welcome all professional temporary tattoo artist and amateur body art enthusiast to our site. The products you will find here will equip you with the tools to create the most realistic and professional temporary tattoo/body art available. Our goal is to provide you with the highest quality Jagua and Jagua products at the most competitive price on the market. Jagua comes from the rainforest fruit Genipa Americana. In its unripe stage, the fruit is juiced and the resulting juice is used to create a stain that South American natives have used for body adornment for more than 2,000 years. 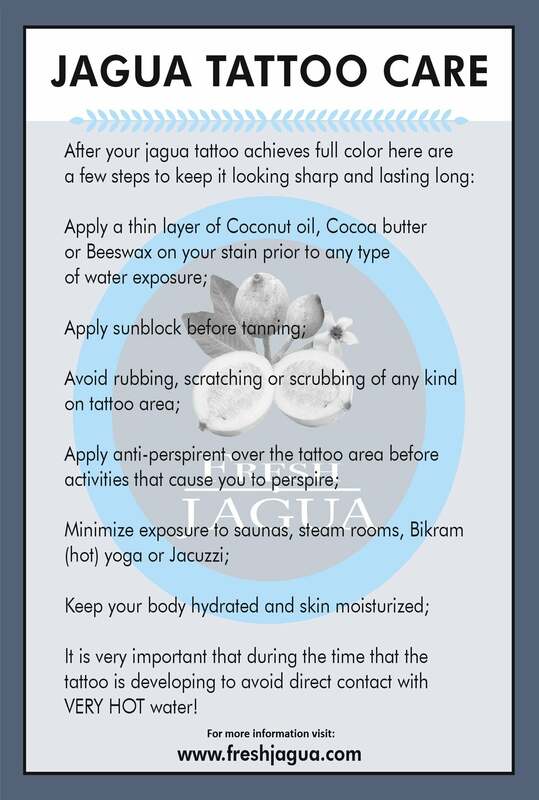 Since it was introduced to the public in 2006, Jagua has taken the world of temporary tattoo by storm. The realistic blue/black, yet temporary stain it leaves on the skin is completely safe and 100% natural. It works exactly like henna with out the hazardous effects of black henna. Having worked with Jagua tattoos on a daily basis for the past several years, we have learned a thing or two about making quality Gel that produces a deep, durable color. The secret is fresh Jagua. As a natural fruit extract, Jagua starts to break down as soon as it is squeezed from the fruit and has a limited shelf life. Although there are methods of preserving and extending the life of the extracted juice, the best solution is to start with a fresh product. No matter what your past experiences with other Jagua products may have been, we guarantee that you will be blown away by the results of our freshly squeezed product. We are so confident, that we offer a 100% money back guarantee for up to 30 days after your purchase. For the sake of great art, we highly recommend that you do not purchase large quantities of Jagua gel at one time. Small batches purchased monthly will result in a higher quality tattoo for you and your customer. If you do decide to purchase a bulk order, please, freeze your Jagua products immediately upon receipt of your order to preserve their staining properties.